I love seafood for several reasons: I love the taste of fish, shellfish, oysters, seaweed. In any way, be it raw, grilled, baked, fried, deep-fried. It's healthy, a very convenient side effect. But most importantly, it cooks fast. This stew is cooked as fast as it can get. The combination of spices gives it a unique flavor. 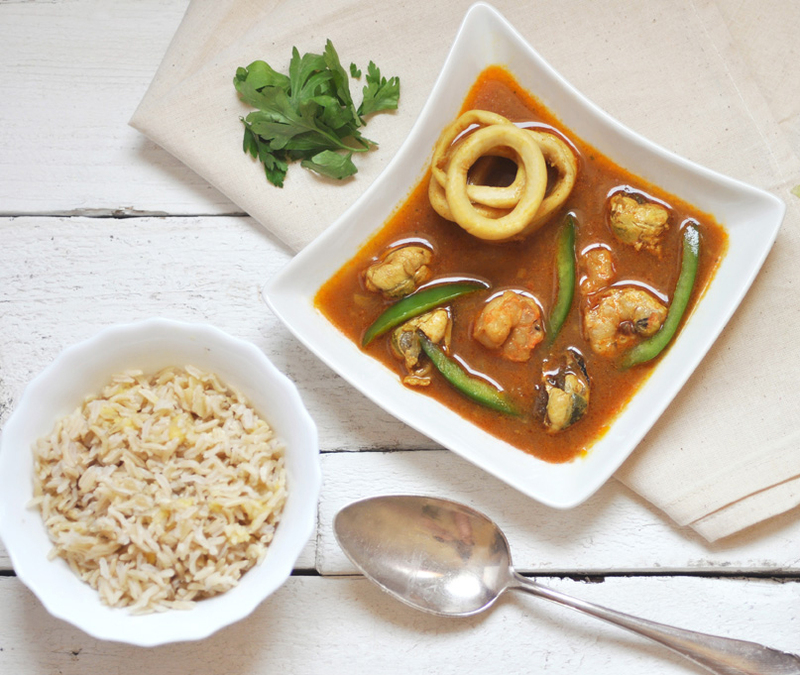 The seafood in it can be anything from a mix or just squid rings or prawns or mussels. In no time, this dish has become one of my favorites: simple, fast, healthy, delicious. Good enough for any weekday dinner after a long day at work. Bon Appetit! Heat olive oil in a pan over medium heat. Add onion and fry until softened. Add garlic, turmeric, paprika and chilli flakes and cook for another minute. Add bay leaf, stock, tomato paste, sliced pepper, seafood mix and white wine. Simmer gently until seafood is cooked, about 5 minutes. Season to taste. Stir in splash of cream (optional). Serve with rice or rustic bread.